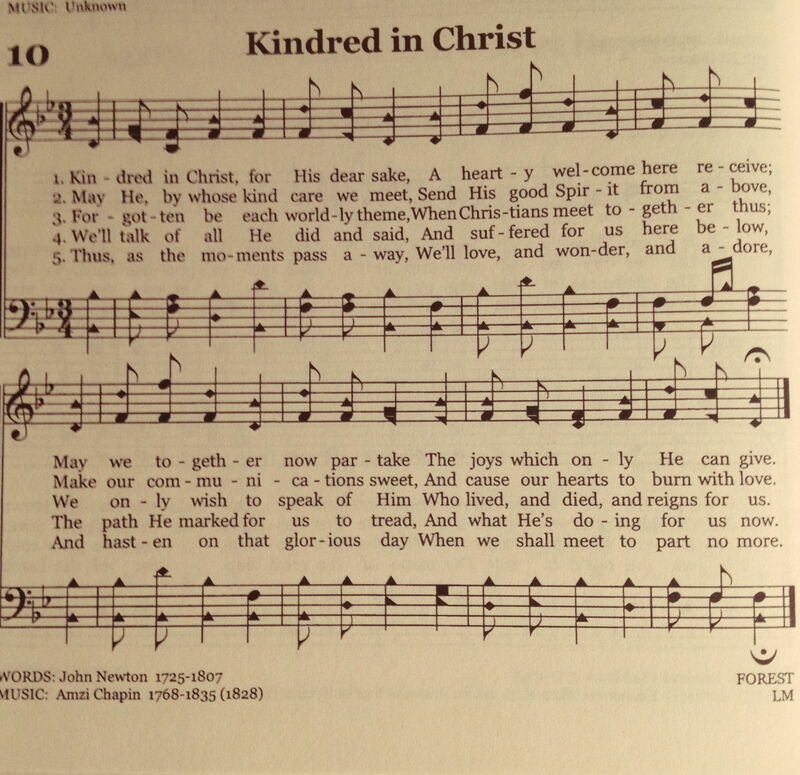 I am thankful for my kindred in Christ. God has so blessed His people by giving them each other. We each go through trials and heartaches that may or may not be known to others, but we have the Lord and His people there to encourage us along the way. These dear ones don’t just feel like family, they are family. Some are actually blood related, but more importantly, we are spiritually related. There is a special bond among His people that is hard to fully describe. I’ve been to another country and met believers there and felt the same bond. 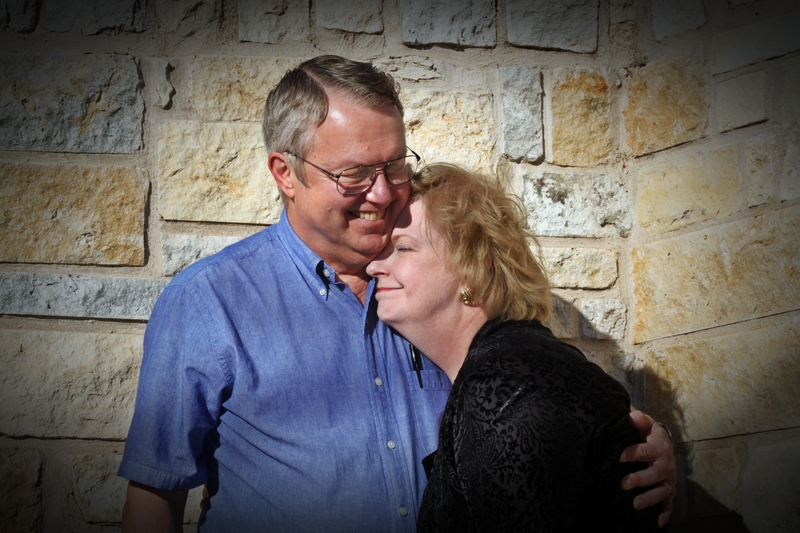 By His blessing, this love for each other crosses languages, customs, and cultures. I’m so very thankful for my dear church and for the dear ones in our sister churches across the country and the world. Thank you, Lord, for your people. Sometimes things happen in life, and we don’t have an answer. The last couple of months have been quite a time of testing in this area for me. I’m not one who typically enjoys a whole lot of attention, but this whole situation being as it is has opened quite a need for prayer. Nearly two months after the incident that caused my left side to go weak, I’m still dealing with that left side not being back to normal. Tests so far haven’t shown anything. I’ve been left with the advice to avoid stress and to have more tests run. Today I was having another test run. Yet, it was one of those days when things out of my control just went wrong causing me to show up late for the appointment. This didn’t exactly help my stress level. Thankfully, they still were able to run the test, and it went fine though I don’t know the results yet. There were no needles involved, so that always makes things easier for me. The lady running the test was quite cheerful and chatty too which made things go smoother. She wanted to know all about Texas once I told her that that was where I was from. Heart echos are pretty fascinating, I must say. I’d never actually looked at my heart before and found myself glued to the screen watching it pump. God is so amazing in how He has designed us! I made it home a little later feeling tired after the stress of the day and still wishing I knew something while at the same time fearing to know something. I have another appointment later this week to go over results from a bunch of other tests that have been run. It’s been quite a road to travel this summer going through all of this and often feeling alone so far away from family though I know I’m definitely not alone. As mentioned earlier, I’m not one for a while lot of attention since I’m what one might term an introvert. After all of this happened, word about my situation spread very quickly literally across the country. It has been humbling to know so many are praying, are concerned, and are lifting this situation up to the throne of grace. It has been hard being away from family and still quite a drive from my home church as I’ve gone through this. However, I have been absolutely amazed to see how the Lord has worked so far in providing for me when I’ve had a need and in laying it upon the heart of a friend or family member to call me and cheer me up when I’ve reached some low points. Today, I wasn’t exactly at a low point, but I was wondering in the back of my mind just how long this weakness was going to continue. There was a package waiting for me in the mailbox when I got home from the doctor’s office this afternoon. A very dear friend of mine arranged for a large number of our dear friends (some of whom I know read this blog) to write letters and sign get well cards to send me in one big package. She wanted to do something after I was so discouraged by not knowing what the problem was when I wanted an answer so badly about a month ago. She decided that flooding my mailbox with love was the best thing to do. She was right! 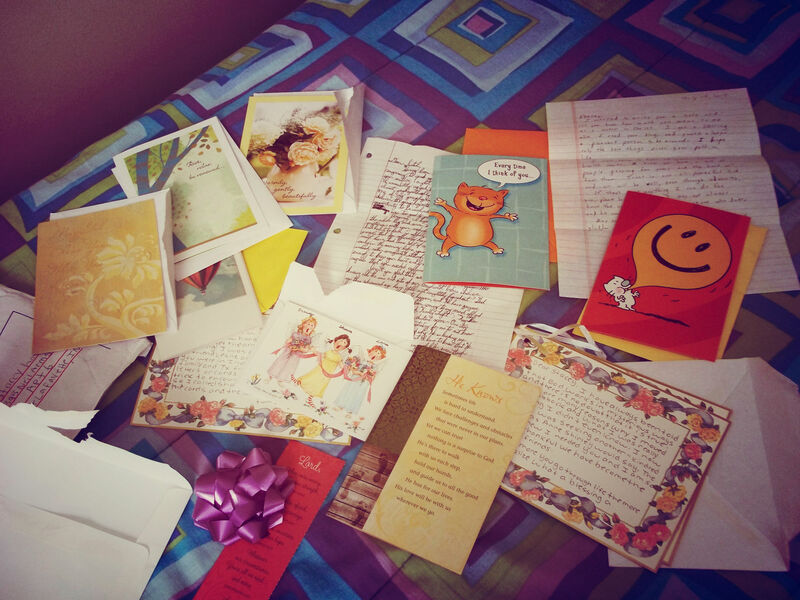 Tears came to my eyes as I read the dear notes and the scriptures the various dear ones had written. My heart feels so full at the moment. I wish I could hug each of you who sent a note or signed a card. This really did lift me up, and I feel overwhelmed by love. Thank you for showing me His love, my dear family in Christ! Just think of all of the feelings and emotions associated with that word. When things go wrong and we’re terribly lonesome, what do we long for most? Home. While we know it’s not perfect, it’s the place where loved ones are and where one feels at peace. It’s like in the game of tag when you run to home base to be safe and catch your breath before continuing the game. At least, that’s how we played it. The location and the building are neither of consequence. For, that is not a home that is a house and a place. No, home is a feeling, it is where dear people are, where love is, where laughter is, where the solace is when sorrow and trials come. At home there is always someone who will hold you when life has gotten tough. There is always someone there who will cheer for you when you’ve triumphed after hard work. There is someone to give you the nudge and encouragement you need when you feel discouraged and down. Home is around the table with smiles and happy aromas. 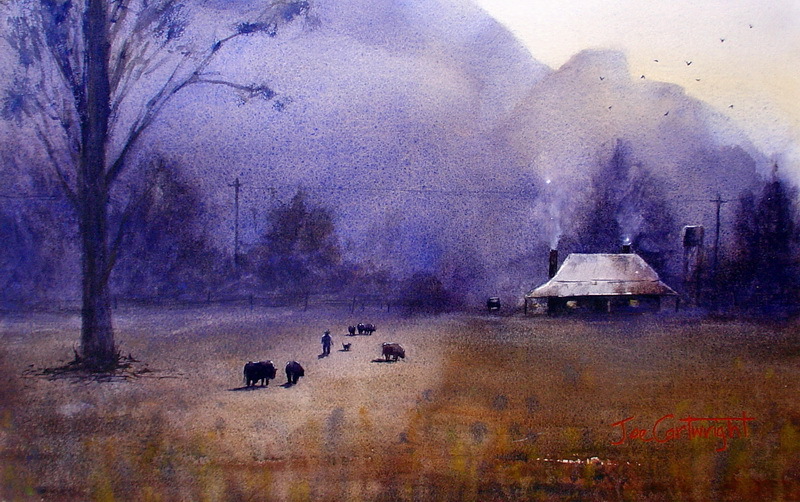 Home is warmth and solitude on a cold winter evening. Home is safety and togetherness. Home is unity. Very often home is with family, but it doesn’t have to be. One can feel at home thousands of miles away from home. Home is sweet and home is dear. Home gives us a glimpse of an even better Home above. This is why it’s okay to long for home both here on earth and in heaven. It’s okay to long for home maybe even cry a little and yet, feel like you are where you’re supposed to be. It means that you have been blessed and are still being blessed. God made home for a reason. He made it as a refuge, and He smiles upon it. Today is your birthday. I have to confess that I’m woefully behind on mailing out a card, but I wanted to do something special on your special day since too many miles separate me from being able to celebrate with you. It’s been too long since I saw you last! Nearly two years! It seems rather odd because as kids, we saw each other every single day and many, many times we could hardly stand each other. Well do I remember us putting our cereal boxes in such a way that we didn’t have to see each other at the breakfast table because of yet another argument. 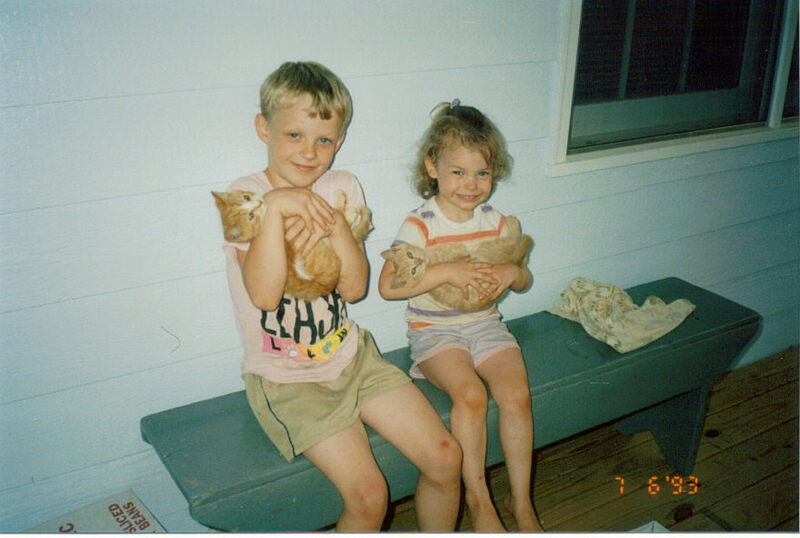 I wish now we had learned to get along a little better, but sometimes I think it’s just part of being siblings. But, I love you, big bro! I remember those late night thunderstorms when I wasn’t the only one running to mom and dad’s bedroom. Later on, you taught me how not to be afraid of thunderstorms. You made me feel safe when I came home crying once because some bullies had threatened to beat me up, but you said that no one was going to hurt me because you’d defend me. No one could make me quite so angry as you could. But then, you had a special way of making me laugh so hard too. Yes, we didn’t always get along and admittedly, we weren’t as close when those teenage years hit, but I still looked up to you and felt that I could confide in you. You were definitely never afraid to tell me when I was wrong, and many times you were right even if it did make me angry. Later on, when we were a little older, you taught me about courage when you stood up for what was right in high school and didn’t waiver even when it seemed like nearly an entire town stood against you. I know after we grew up, difficult, fearful years followed, but none of us ever stopped loving you, and we never stopped praying for you. We believed that God could work a miracle, and He did. Your life is proof of that! The most important thing you taught me through those hard years was about forgiveness and God’s amazing conquering love. I’ve seen God’s power and His grace in your life. I see a humble and compassionate spirit in you, and bro, I want to be more like you. I hope you have a very blessed, restful birthday, bro! I’m proud of you! I miss you and love you! I’ve been wrestling the last few days about how to exactly put this into words. I even missed getting it posted by Father’s Day because of a trip, and well, I’m still narrowing down my thoughts. So, here goes! In today’s society it is not uncommon to see fathers put down or made fun of as dumb and always failing. One only has to simply flip on the TV to one of today’s popular sitcoms to see classic examples of this. We so often get caught up in what is wrong with fathers that we forget to encourage and honor those who are truly trying to be a good husband and father to their wife and children. My dad is a hard worker. Before I could really remember, my dad lost his job. He had lost jobs before I was born too, but that particular time it was hard from what mom told me. He had six kids still at home and mom had to work for a while until he found another job. It was a tough time for my parents that I didn’t really understand until I grew up. The thing about dad was that he was willing to work any job and do it well in order to earn money to support his family. He delivered pizzas, tiled floors, did repair jobs, any work he could find. He never complained either. Both mom and he taught all of us kids how to work hard and how to do a good job although their tool was household chores and a summer garden. My dad loves my mom. 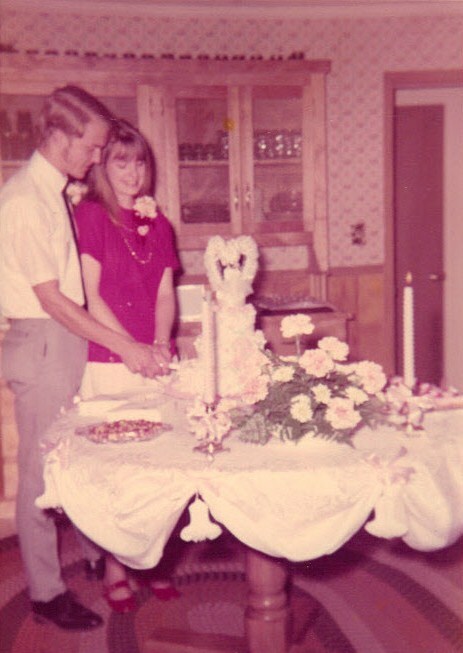 My mom and dad married really young. Mom was 18 and Dad was 19. 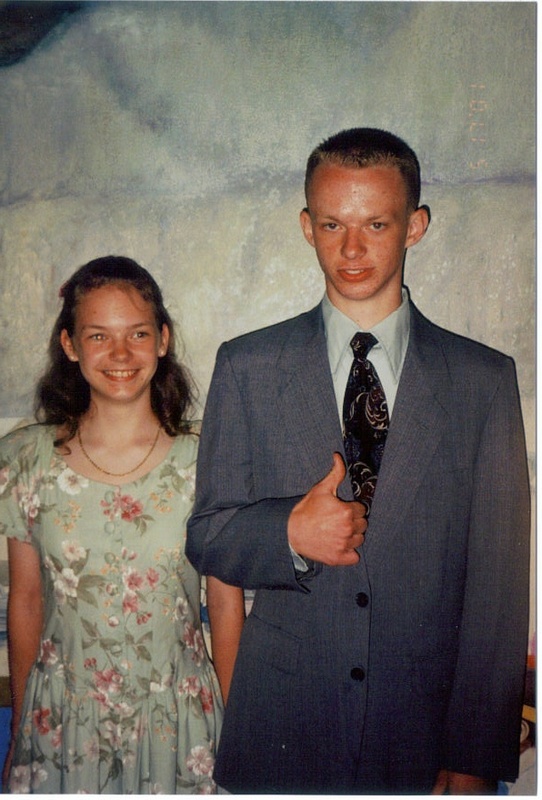 I know some speak negatively of marrying young, and in many cases they’re right, but it was not so with my parents. How did I know as a young child that my dad loved my mom? Well, for one, my dad always came in from work and kissed my mom as soon as he walked inside the kitchen where she was usually preparing dinner. He loves to tease her and make her laugh. Usually you know he’s succeeding when you hear a half-laughing, half-exasperated “Sam! ?” from mom. He honors her and takes care of her. He’s a handy man around the house, so he fixes things and makes improvements on the house as part of taking care of her and providing her with a comfortable home. He’s provided an excellent example of what a husband and father should be for all of us. You see, my dad loves to laugh. He tells corny jokes and LOVES it if he can find a pun in a sentence. However, one of his favorite ways to laugh when we were kids was to make us laugh. Hence, he would keep us laughing until we could hardly breathe in his role as the Tickle Monster. Even some of my little cousins and nieces and nephews came to call him this. Being a chiropractor, he especially knew the perfect ticklish places in particular about squeezing a place just above the knee which nearly makes you collapse in giggles because it tickles so much. Oh, the little games we invented some Sundays after church waiting for lunch to be ready just playing and laughing with dad as he sat on the couch! I think my favorite memory of him as the Tickle Monster was one time when my older brother was about 11, I was around 8, and my little brother was probably 5. Dad had been chasing us through the house tickling us, but as he ran down the hall, he knocked a picture off the wall which made a loud *WHACK!* . Mom was instantly at the door of the kitchen wanting to know what just happened. 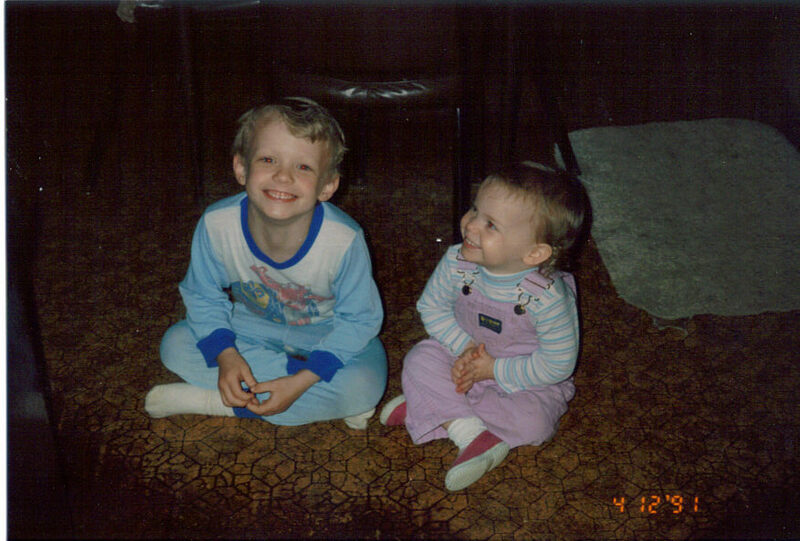 When we were in trouble, we always ran behind this pink recliner that was next to a wall in the living room. The difference this time was that dad was standing with us three kids behind it looking like he knew he was in trouble but was struggling to contain his laughter. Mom thought it was one of us, but Dad just looked at her and grinned. What was priceless was her change of expression from rather severe to surprise as it became clear who was the real guilty one, and she responded, “Well, Sam! That beats all I’ve ever seen? It was you? You’re like one of the kids! Well! I sure hope it’s not broken!” Thankfully, the picture was unharmed and put back on the wall, and we were off the hook as long as we agreed to not play that game again that day. So, Dad sat on the couch and thus ensued the next game of seeing how close we could get to the Tickle Monster without succumbing to the giggles of being tickled. Dad throws the ball, and it bounces around and then goes right in the hoop. I grab the ball and try to shoot it, and it bounces off of the hoop and out of bounds. I don’t have a picture of us playing HORSE mostly because we were so busy playing, we didn’t always take pictures of such games, but it never ceased to amaze me how Dad could shoot those hoops so well when he rarely ever practiced. As a kid, I just figured that was just one of those things dads just inherently learn to do much like cutting grass and working on cars or some of those other dad jobs. Actually, Dad’s pretty much good at any game he plays. Most of our family get-togethers involve large card or domino games around the table. 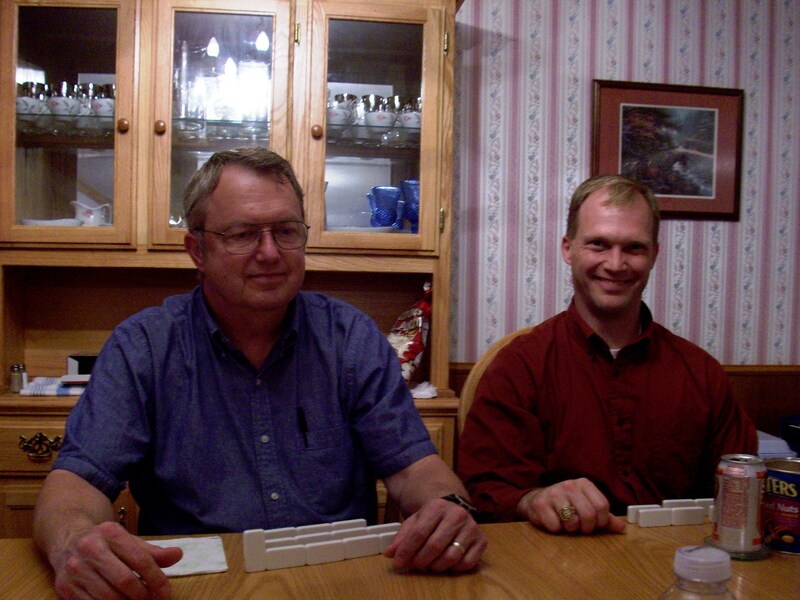 This particular picture is of dad and my oldest brother during one of our traditional domino games at Thanksgiving a couple of years ago (My brother’s a dad too, and well, as you can see in the picture, there’s a whole other story there). Well do I remember the many Saturday evenings spent playing cards or Parcheesi. Dad loved Parcheesi and seemed to consistently win that game too. The other thing I love about my Dad is that he’s there. If I have a question, a car problem, something I don’t understand, etc, I can always ask Dad. It’s his way of taking care of me. For example, right now, I’m getting ready to move away for graduate school. He’s pretty much taken over planning the road trip, looking up costs of moving vans, and giving me an estimate of how much the gas and truck are going to cost. He started working on this before I’d really completely figured out exactly where I was going to school although by that time, I figured it would very possibly be Indiana. Sometimes we didn’t have to necessarily talk. When I was a teen still in high school, he and I would often sit in silence in the den just watching a crime investigation show or football game. We’d make comments now and then or laugh at something. Sometimes he’d have to explain some of the rules of football, but we’d usually watch games in which we didn’t particularly care which team won. This was because we were often more just interested in relaxing and seeing how a game would unfold. At other times we just sat at the island in the kitchen sipping coffee on Sunday evenings while he snacked on cereal and cinnamon bread. He always has his one sweetener and ice cube in his coffee. I think I get my like for not too much sugar in my coffee from him actually. By the way, Dad makes the best cinnamon bread a kid could ever want! At least, it’s always been the best to me. Aside from those practical issues though, Dad is calm. If I’ve ever had a question about something Biblical, he’ll think a minute and then tell me what he knows or what he has studied. He’ll also bring up what he’s heard in sermons, from preachers, or Bible studies to help answer the question. Dad seems quiet, but he has quite a deep understanding of the things of God. It’s good to have him there to answer questions and provide solid advice. My dad loves my siblings and me! Being a dad takes time as any good father will tell you. Dad was often busy working, but as I mentioned above, he took time to play games with us as he could. One often hears about love languages and what kind of love language one uses and what kind the other dear ones in your life use. Based on how I know my dad, his way of telling you he loves you is not necessarily verbally but through his actions. I can’t even begin to name the many things he’s fixed around the house, on our cars, or just that little thing that broke that I couldn’t figure out how to fix. I still take things to dad to see if he can fix them, and if he can’t fix it, it probably means you either need a new one or you don’t really need it anyway. In sum, Dad’s way of expressing love to us has been through his acts of service to us. He even was brave and taught the younger three in my family how to drive. 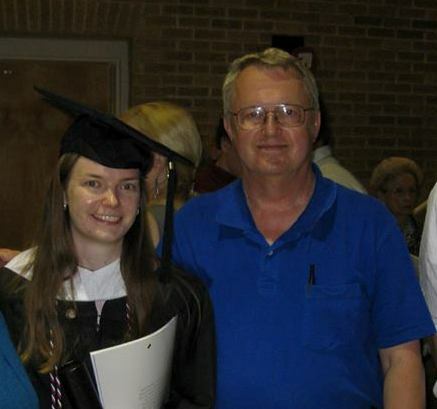 So, maybe I didn’t cover everything I wish I had time to about my dad. I’ve thought of so many things to write over the last few days of working on this post! However, I suppose, the best way to wrap up is to say that I am very thankful for the blessing of having my dad in my life. Each child is given to each parent by God for a reason and a purpose, and I’m so thankful to be able to look back on my young life and see where God has so often molded me and made me who I am to serve Him through my parents. Have you ever had it where you are insanely busy, but there are thoughts in the back of your mind that seem to continue to ruminate and churn? This has been the case with me. I am usually so busy with never ending homework and obligations that I can hardly keep things together but there is always something brewing in the back of my mind and sometimes I have to find a way to let it out to think it through. During this churning process, I’ve been thinking about love. Not so much in a romantic sense although that does come into play but just mainly on how wrong the vision I see of it is. Let me explain a little to give you a little bit of a background to my thoughts. I keep having to read the French novels where the main characters usually end up in a “forbidden” relationship but claim to love each other and give everything because of this idea of love. The result usually is unhappiness and despair. I was working on stuff late this evening at school and heard a rather disappointing revelation about some ideas of love/infatuation or whatever one would define it as. My point is that I keep running into the fake manifestations of love in just about every place I look. It is all anything but what love is. Love is not found in chivalry. Love is not found in desire for what is forbidden. Love is not merely what is on the exterior. Love is not what I can get from you or vice versa. No, my friend, love is so much deeper, so much more full than anything one can just grasp in a single moment, but at the same time one can grasp it in an instant. Why do I write this? Because it puts me nearly in tears to realize what others fall for as a figment of love that is not real. When I see, how fake and temporal what they grasp a hold of is, it makes me want to double check my footing and look inside to see if I grasp to something as frail. I want to yell a warning, but will they hear? Will I hear? This summer I witnessed a scene that I am still struggling to put words to. I feel like an artist in front of a blank canvas trying ever so earnestly to figure out how to paint the picture in his mind. My paint is words, and the canvas is this blank page. I saw a family shaken by grief but still standing. The small infant they had loved so dearly was born without the breath of life. They had found out just before he was born that it would be so. They had held him in their arms and the tears had fallen down their faces as they knew that they would never hear his cry or feel his warmth. He was gone. The mother walked down the aisle with her family at the funeral clutching the blanket they held him in. Yet, though they were shaken, they were not moved from their foundation. 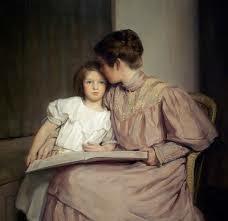 Love upheld them, yet not a love that passes away by each fading fancy. No, this was a love stronger than that. This was a love that upheld David in his times of trouble, that upheld Jeremiah as he preached to a deaf nation, that upheld Hannah as she prayed for a child, that upheld Ruth as she left all to go into a foreign land. This family had tears for their loss but they were not without hope and not without love. Why the flower? Because there is love in this world that is beyond anything this world can imagine about love. His love found me when I was broken and bound and He only He raised me up to life. He gives me strength. He gives me life. 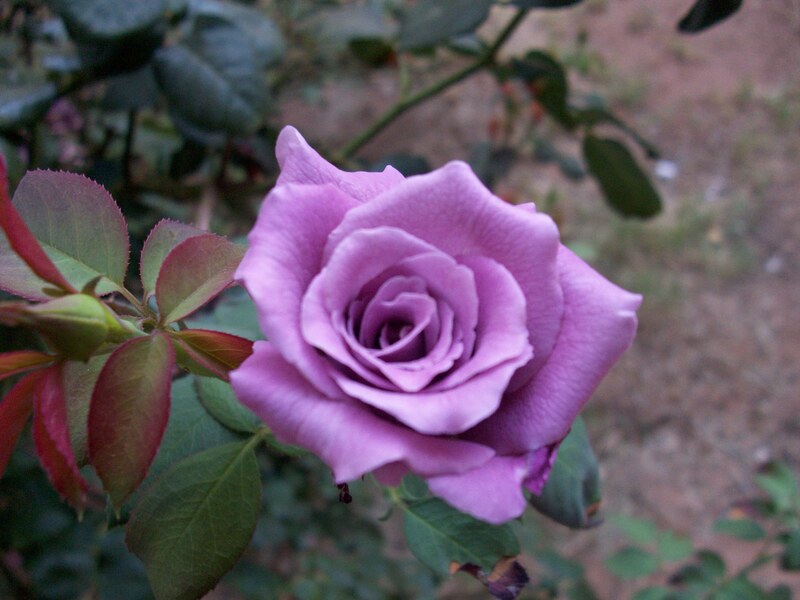 He gives to me the joy of seeing this flower in the morning, but more importantly He taught me what love is.